He left the UK for Australia in 1926. 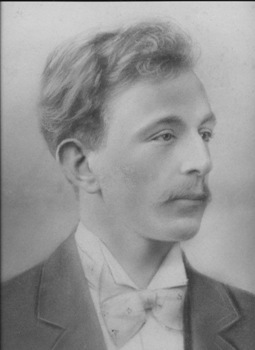 Frederick Charles William Healey was born in Brentford in February 1909. Tony advises he was known as 'Bill Healey' so this name is used in the following notes. In 1911 Frederick, his wife and Bill (age 2) were living at the same 330 High Street address (1911 census on findmypast website). Frederick was a 'coffin maker' and he was a 'worker' (not an employer). In the column 'Industry or Service with which this worker is connected' Frederick wrote 'undertaker' and he worked from home. He was born in Dunstable, Bedfordshire, his wife was born in Brentford and they had been married 5 years. Their home at 330 High Street had four rooms (NB not all rooms were counted, eg a shop or office did not count, a kitchen did). A 1911 trade directory shows W C Barratt, undertaker at 330 High Street, Frederick Healey's employer. 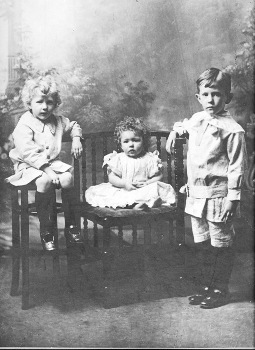 Later in 1911 Bill Healey's younger brother Arthur was born at 330 High Street, then in 1914 a sister, Iris Ada M.
The studio photo shows (from left to right) Arthur age about 3 or 4, baby Iris and Bill, age 5 or 6. In a 1920/1 street directory Frederick Healey is recorded at 38 High Street (no occupation is recorded). In 1911, 1913 and 1914 trade directories 38 High Street was the address for A Sargeant, undertaker - so it is possible Frederick Healey moved to this address between 1911 and 1920 to work for A Sargeant). Tony provided two school photos, the first shows his grandfather Bill Healey's class in their classroom and the second a group of boy violin players including Arthur Healey. Tony believes Bill left school at around 14 or 15 to open a 'wireless accessories' shop from his home at 38 High Street. 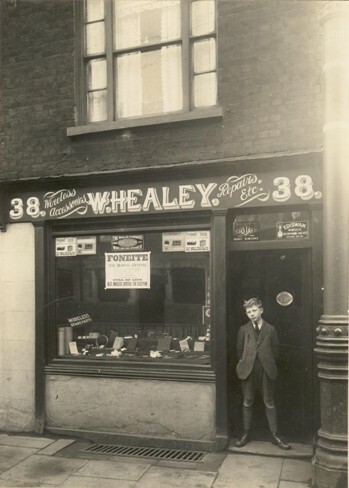 Tony's photo shows the shop, presumably shortly after it opened, with younger brother Arthur Healey in the doorway. Arthur appears to be 12 or 13 suggesting the photo dates from around 1924. 1928 and 1933 directories record 'Frederick Healey, wireless accessories' at 38 High Street. Tony notes Bill Healey emigrated to Australia in mid 1926 as an Indentured Lad at the age of 17/18, perhaps the trade directory entries are in his father's name? Trade directories for 1937 do not include reference to Frederick Healey and a 1938 street directory shows no properties for this area of the High Street, it having been taken over by the Brentford Gas Light and Coke Co. Returning to Bill, Tony has a reference for him dated 1926 from the school to the Australian Government on Middlesex Education Committee letterhead saying that Frederick Charles William Healey was a Scholar at the school for some years and of good character and very clean in mind and body. It was signed by the then Headmaster, Captain Leonard Revell, who appeared to know him. Tony adds: I believe that my Grandfather's younger brother Arthur kept the shop on for an unknown period of time after Bill left for Australia. I have met Arthur's Children and Grandchildren who have not fallen very far from the apple tree and still live in Bedfordshire & Surrey. My Great Grandmother Edith Healey lived to a grand old age of 96, she died in Windlesham on 14th March 1976, looked after by Arthur's family. (There is a death registration of Edith Hanna Healey in the first quarter of 1976, Surrey North Western). Bill and Arthur also had a younger sister Iris, born on 19 May 1914 and died on 8 April 1969 at Hendon. I believe she contracted TB as a child and although doted on by her older Brothers and Mother she died in middle age. (There is a death registration of Iris Ada M Healey in Apr-May-Jun 1969 in Hendon age 56). Apparently Iris was something of Clairvoyant, I am sure there is a story there? Sandra adds:I wonder if they gave up on emigrating because I remember Dad saying that Iris became ill when she was about 18, that would put it about 1932. Apparently she was enjoying life and going out a lot and had a boyfriend. The family reckoned that she caught the TB when she 'caught a chill' having been out on an evening(s) inadequately dressed in the cold weather. Of course, it is more than likely she may have had the disease for some time previously. Tony notes: the "In Their Footsteps" Australian TV show focused on my Grandfather's time serving with the RAAF in Bomber Command and later as a POW at Stalag Luft iii at Zagan. The marriage certificate for Frederick Healey to Edith Hannah White in 1905 shows Frederick was the son of Benjamin Healey, gentleman, and Edith Hannah was the daughter of Charles White, barge builder (deceased). 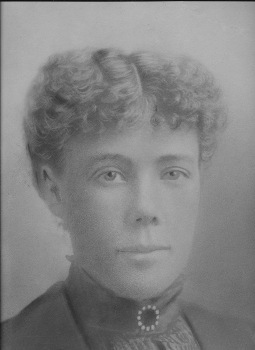 William George White, Mary Frances Shackleford and Rose Shackleford witnessed the marriage, the service was performed by 'T Selby Henrey'. Edith Hannah was living at 60 Ealing Road at the time. 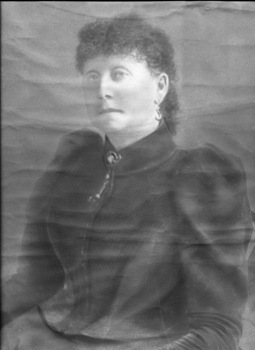 Tony and Sandra sent a family portrait of Caroline White, Sandra Ireland adds 'Caroline White was the mother of Edith Hannah White and the White family lived in New Rd Brentford when Edith Hannah was born but moved to 60 Ealing Rd later.'. The 1871 and 1881 censuses show the White family living at 2 Stephen's (or Steven's) Cottages, New Road, and use of Google StreetView in conjunction with the 1894 OS Map (Alan Godfrey reprint) suggests the White family lived at 43 New Road (the property survives, a few doors down from the Royal Oak).